The Ducks are back and have their sights set high for this upcoming season. Led by a group of hungry veterans and up and coming young talent, especially on the offensive side of the ice, Anaheim has their eyes on reigning atop of the Pacific Division and bringing home another Stanley Cup. Division rivals, the Los Angeles Kings and the San Jose Sharks will look to prevent the Duck's championship aspirations. Grab your Anaheim Ducks tickets and head down to Honda Center to be a part your teams championship quest. In July and August of 2017, there were quite a few developments in the Anaheim Ducks camp. It all started with Ryan Kesler being sidelined for four to five months due to an off season hip injury. This was followed by reports coming out of the Ducks camp of signing Sam Fowler for eight years. The news was confirmed on July 1. And in August, the Ducks signed Francois Beauchemin for one year. This most recent season, the Ducks failed to win the Pacific Division for the first time in five years. They placed second to the new expansion team, the Vegas Golden Knights. They did advance to the post season but were swept by the San Jose Sharks in the first round. Looking to come back and win the Pacific Division this year, the Anaheim Ducks are all geared up for the 2018-19 NHL season. Their eyes are set on making it past the first round of playoffs, and winning the Stanley Cup. Paul Kariya’s Impressive Comeback 2003 – Off the floor and on the board is how a commentator described Kariya’s injury in the 2003 Stanley Cup Finals between the Ducks and the New Jersey Devils. In game six, Anaheim’s Paul Kariya was elbowed in the face and knocked out by New Jersey’s Scott Stevens. Kariya, who has a history of concussions, lay motionless on the ice for several seconds before taking a giant gasp of breath. Kariya was escorted off the rink and many thought he would not play for the rest of the season. However, he surprised everyone when he made it back to the bench, and scored a decisive goal against the Devils. It truly is one of the most triumphant moments in the Ducks history. First Stanley Cup Win 2007 – By 2007, underdogs Anaheim were already Stanley Cup fan favorites. Chris Pronger became a part of the roster and the team began the finals with impeccable performances. They sailed through the first quarter without any major setbacks and achieved record-setting point totals. On June 6, the Ducks beat the Senators 6-2 in their hometown at the Honda Center and won their first Stanley Cup. 2007 was a good year for the Anaheim Ducks. Los Angeles Kings– The two teams’ hometowns are separated by a mere 32 miles and this proximity has earned their games the nickname the Freeway Faceoff. The rivalry between these two neighboring cities has carried on away from the game as well with fights between their fans in stadium stands and parking lots. This is a brewing rivalry at present that has the potential to boil over in the next few years. Dallas Stars–The Ducks have faced the Dallas Stars in many playoff games. A rivalry was struck up between the two in 2014, and Stars fans particularly began disliking Corey Perry after that. The two teams have gone neck-to-neck since then and the Ducks avenged every victory by the Stars in follow-up games. The playoff record is leveled at six wins each for both teams. Corey Perry is celebrated by Ducks fans due to his aggressive playing style. His partnership with Ryan Getzlaf is particularly lauded for its game winning plays. Essentially, he is the backbone to Getzlaf’s setup shots, providing that final punch to them. Scott Niedermayer joined the Ducks after defeating them as a part of the New Jersey Devils. Considered one of the best offensive-defenseman in NHL lore, Niedermayer simultaneously setup shots for the Ducks and scored goals as well. Chris Pronger too, played a similar role, and together these two impactful players would patrol the blue-line of the defense-oriented Ducks. Playing their home games in Anaheim, the global epicenter of family fun, the Ducks offer one of the best hockey environments in the world for fans of all ages. At the Honda Center, fans can now enjoy the newly renovated Grant Terrace for a one of a kind game-day experience. So whether you’re in from out of town to see Mickey and the gang or you’re a So-Cal local, don't miss out on one of the most promising teams in the NHL. The Disney-owned franchise is expected to face off against some of their biggest rivals at home and away. The Sharks and Los Angeles Kings’ games have been announced amongst many others. Anaheim Ducks playoff tickets are available here for purchase. Our process for purchasing cheap Anaheim Ducks tickets is simple and fast. There are so many online ticketing sites, that it can be hard for customers to find the right place to buy Anaheim Ducks tickets at the cheapest price. At ScoreBig we think of our customers first and foremost. We offer daily deals for Anaheim Ducks events, so our customers can get the best seats for the best prices. ScoreBig will always go above and beyond to offer the cheapest Anaheim Ducks tickets on the market. The Anaheim Ducks schedule above, displays all available events for 2019 and 2020. Once you find the event that you would like to go to, click the red “Get Tickets” button. It is located on the right-hand side of the event listing, it will take you to an Anaheim Ducks event ticket page. ScoreBig's event ticket page will display all available Anaheim Ducks tickets for that event. On the event ticket page to help with your search for the right Anaheim Ducks tickets, use the filters at the top to select quantity, price range, and more. There is also an interactive seating chart so you can pick where you want to sit. When you are ready to buy a ticket, click on the listing, and you will be directed to ScoreBig's checkout page. Upon completion of the information fields, your order will be processed and your Anaheim Ducks tickets will be delivered via email, mail, or to your mobile device. What makes ScoreBig’s site stand out from the rest? We are constantly analyzing our competitors to improve our site, service, and prices. ScoreBig.com employees strive to offer the best process and experience to buy cheap Anaheim Ducks tickets. Our goal is to get you the best seats to Anaheim Ducks events. We offer daily discounts on our site and for special promotions check out our newsletter. If there are no Anaheim Ducks events currently available, you can use our search feature at the top of the page to see a list of all popular events going on near you. 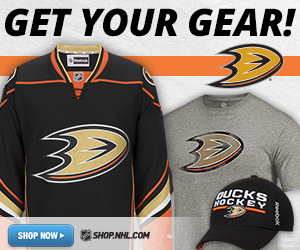 No matter your price point, we have all the best deals and discounts on Anaheim Ducks tickets. For more information on prices of Anaheim Ducks tickets and the schedule for Anaheim Ducks, check out our listings above. The last thing you want to find out is when the Anaheim Ducks event you wanted to go to is sold-out. Don’t worry in many cases ScoreBig has affordable tickets to sold out events. We sell tickets from GA all the way to premium seating and parking. Skip the scalpers in the parking lot and get your tickets online from top Anaheim Ducks ticket brokers. We get you in all events, buy your Anaheim Ducks tickets here from a brand that many trust and rely on for all their ticketing needs. ScoreBig offers a 100% money-back guarantee. If you have been in search of cheap tickets for Anaheim Ducks, ScoreBig by far is the best option. That’s why ScoreBig has more loyal customers than any other ticketing site. Shop at ScoreBig for safe and secure Anaheim Ducks event tickets.